Having almost completely conquered the market with its Live Roulette tables streamed directly from real bricks and mortar casinos, Authentic Gaming is back with a new equally captivating version of the game. It’s called Live Auto Roulette 30s and is a live version of electronic Roulette which is ideal for players who don’t have any time to lose. Live Dealers Casino has tested it for you and this is our review. As is implied by its name, Live Auto Roulette 30s is a version of automatic Roulette with games at regular 30 second intervals. Within this time frame there is a complete game with bets being placed, the ball thrown and stopping and winnings paid out on winning bets. This gives an idea of how quickly everything goes. To avoid players being surprised by the time, the developer has added a stopwatch that is set off at the start of each game. The software also clearly indicates every time, the start and end of betting. 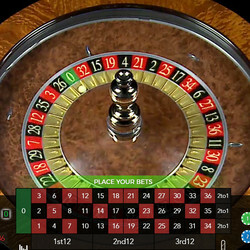 Ideal for players in a hurry, with Live Auto roulette 30s one can play up to 120 games in an hour if one plays non-stop. Of course, one can also miss a go….. When one doesn’t have much time to bet on each spin, it would be ideal to have easy access to the chips and commands at the table. Authentic Gaming has optimised this aspect with its ergonomic interface. Easy to operate, one can place bets in a few seconds. Also, like at other Authentic Gaming Live Roulette tables one can access various useful functions such as statistics and the results of the latest spins. Favourite bets and other short cuts can be set to play more quickly and intuitively. Authentic Gaming’s Live Auto Roulette 30s is like European Roulette with just one zero so the rules are quite similar to this version. Full winning bets are paid out 35:1 like at a classic European Roulette table. The bets accepted at this automatic Roulette table go from € 0.2 to €100 per spin. Like Authentic Gaming’s other versions of live Roulette, Live Auto Roulette 30s is available in Casino Extra, Lucky31 Casino, Dublinbet and several other online platforms partners of the developer. The game is accessible 24/7 and is available in optimal format on Pcs as well as smartphones.